You wake up on a Saturday morning and what better way to start the day than some home-cooked food! This is where the versatility of a grill or griddle comes in. Eggs, bacon, or pancakes – the choice is yours. Then you think about lunch. How about some burgers, sliders or hot dogs? Or maybe some Mexican with quesadillas or fajitas. Lastly, seafood or steak for dinner? Or maybe some corn on the cob! To achieve these yummy treats, you need a flat top gas griller. But where do you start? Which one do you choose? That’s where we come in! At Grills Forever, we will find the best flat top grills and griddles for you, taking out the hard work and presenting them to you here. No more traipsing around the stores looking at all the grills and griddles! Our handy, easy-to-read reviews will give you all the best insights into the best grills and griddles out there in 2018. What to Look for In a Griddle? One of the most versatile grill types that we’ve ever tried is the flat top grills. Flat top grills have a certain advantage over regular grills in that they can be used to cook different types of food all in one go. Think of pancakes, eggs, and even fried rice. And if you want some meat, you can also grill some steaks, burgers, and hot dogs. Flat top grills also give you control over your cooking temperature. You can choose your temperature settings for different types of food. And the best thing about it is, you can use it both indoors and outdoors. You can set it up for a nice barbecue weekend with friends, or cook breakfast everyday on your flat top grill. But choosing which flat top grill to get for your home can be time-consuming. With all the brands and models claming to have the best features, you can easily get lost in the details. That’s why we at Grills Forever have made it our job to do the dirty work for you. 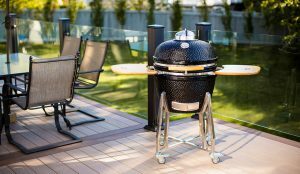 We’ve rounded up a list of the Top 10 Flat Top Grills for 2018. 72 hours of research and product testing led us to these griddles that we think have what it takes to suit every home’s needs and requirements. This grill has so many features that you won’t believe the reasonable price it costs. There are zero negative points to this grill, instead it is just awesome and that is why it is our favourite! 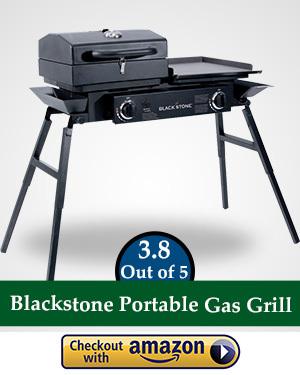 The Blackstone Table Top Grill is a portable grill with 260 square inches of cooking space. It’s very portable and makes a great cooking tool for outdoor parties, camping trips, hunting escapades – name it, you can bring it literally everywhere! And when the weather’s not so cooperative, you can enjoy a big breakfast at home with pancakes, eggs, hotdogs, bacon – the works. It uses propane gas for fuel, is made of sturdy stainless steel. The best part is it’s very easy to clean and store. At under $99, this table top grill is a definite steal! This grill is our advanced pick as it has everything a professional griller could need. However it is expensive, but you get what you pay for as it boasts features including four individual burners. 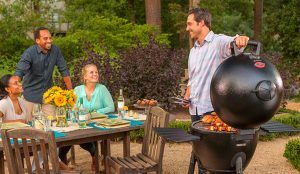 The Blackstone Outdoor Flat Top Gas Grill is packed with features that are great for those who like to hold large parties, and is even great for professional use. It’s large cooking space of 720 square inches and four cooking zones with separate burners makes it possible to cook different items all at once. It has a detachable griddle, side tables, a shelf underneath, and also comes with wheels. It’s portable and great for outdoor parties and events, and can work well for professionals and amateurs alike. It’s a bit on the expensive side at $222, but it’s definitely worth every penny with its many amazing features. This grill is for those of you who want to get a great grill, but not spend too much money. It does use a fair bit of electricity, but it is easy to clean and put away, and gets a load of rave reviews from happy customers. 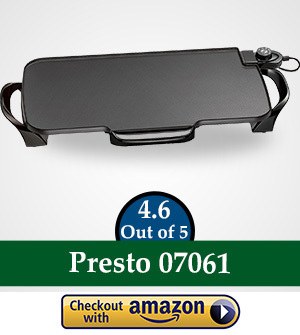 If you’re a small family, or someone who likes to move a lot, or you are on a budget but still looking to buy a functional and portable griddle, the Presto Electric Griddle is for you. This lightweight, slim and portable griddle features a non-stick cooking surface which lets you cook with little to no oil. It’s 18 square inch cooking area is just right for cooking those breakfast stapes that everybody loves. It’s also easy to clean, and has detachable handles so it stores perfectly into small cabinet spaces. Whether you cook at home or like to go out hunting and camping, all you need is a power source and this electric griddle will happily cook your meals for you. At a very affordable price of $30, it’s definitely the budget-friendly choice. This grill is about being able to do multiple things all in one device. It is dual sided, so you can grill and griddle, and it is easy for beginner griller’s to use. This is a highly recommended grill! This reversible griddle and grill is pretty one of a kind among all the flat top grills we came across. The long-lasting griddle/grill is made of cast iron and has a ribbed grill side and a flat griddle side so you can use it for grilling meats, or cooking pancakes and eggs. It’s robust body is also pre-seasoned to make it non-stick, perfect for your breakfast staples. It’s pretty easy to use, too. Simply place it over your stove burner, and cook away. This combo griddle and grill is perfect for outdoor camping trips as it’s easy to bring along with you. No portable stove is no problem, too, since all you need is to set up an open fire, place your griddle/grill over it, and food is on it’s way! Best of all, it’s also priced affordably at less than $40. But, here’s the question! Why should you trust us at Grills Forever? If our name alone doesn’t reassure you, then our five years of systematic product research might! We have tons of experience in researching grills and our sole purpose is to help you, our readers, to choose the best flat top grill for you. We have come to our conclusions on the best grills and griddles after more than 72 hours of research. We also had several people involved in the process, which has allowed us to eliminate any biased or subjective reviews. We also looked at different brands of products as we do not set out to promote any particular brand. In our research we reviewed over 12 a range of brands and over 37 different products before shortlisting the best 19 that we found. After this, we selected our top ten from those and ranked them into our top ten order. We selected those products that will benefit all different kinds of people, from those at home to professionals. So, whoever you may be, we’ll find a grill for you. Griddles are an extremely versatile piece of cooking equipment that can cook many different types of foods. They have a flat, non-stick surface for cooking food with small drainage holes which siphons off any fat during cooking. They are used mostly for grilling foods quickly or to do stir-fries without any smoking or using charcoal. This makes them ideal for breakfast cooking: bacon, eggs, pancakes, sausages! Whatever you fancy! 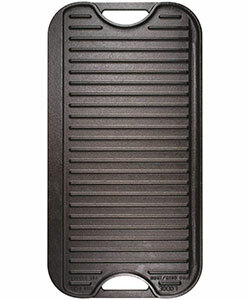 Most griddles are rectangular which gives you an even bigger area for cooking that a standard, round frying pan would. They also have different heating areas for cooking with different temperatures. You can keep items that you’ve cooked on the cool side whilst cooking new items on the hot plate. They can basically do anything that a frying pan can do but with the added advantage of being a much larger size. So what makes them different from grills? A grill is like a griddle except they are not flat and has distinct raised ridges that leave grill marks to give your food that well-defined grilled look. This makes them great for meat – steaks, hamburgers and chops and the ridges help to separate the food from the grease, reducing the fat content in the food. Some griddles are even reversible meaning you can switch over your griddle and make it into a grilling surface. Neat huh?! As we’ve said, griddles are really very versatile. They’re ideal for cooking for a bigger crowd due to their larger surface area. Also, there are usually no sides (such as you might find with a skillet) means that you can flip foods really easily and there’s no moisture trapped in the food meaning that foods are as crispy as they come. Hash browns can’t be beaten. Electric griddles have extremely even heating, meaning that the entire surface area can be used for cooking. With stove-top varieties, there might be some variation in the heat. Electric griddles can also be used on the countertop, meaning that it frees up the stove for other things, for example, during big cooking extravaganzas such as at Christmas or Thanksgiving. Griddles are easy to use and also a healthier way of cooking as the grease simply drops off through drainage holes, keeping your food grease-free and healthy. Griddles can also have a warming function to keep batches of the food warm while you are cooking something else. Griddles don’t gather coal or burnt on things after cooking. With the grill being so clean, every time you fry it’s as good as it was the first time you used it. So, we’ve now established that you need a grill, even if you didn’t realize it before! But, what do you look for when choosing a grill? Well, as the saying goes, bigger is better, in terms of cooking area at least. More cooking space means you can cook for more people. You should also look at the drainage holes and their size. The best grills have large drainage holes for collecting as much grease as possible from the food, making your food healthier and crisper rather than greasy. The surface material is also of big importance. You really need the best non-stick material which is durable and will not rust. Fuel type is also important. There are electric and gas griddles out there. You should also consider any burners – the more burners the better the temperature consistency and distribution will be. Hopefully, taking all of these elements into consideration, you will find the perfect grill for you! We know what we’re looking for in a griddle or flat top gas grill. As mentioned, we’ve done over 72 hours of research to reach our conclusions. Indeed, we went through over 17,000 user reviews looking at different products in order to determine which features are considered to be the most important ones that users need and search for in flat top gas grillers. We looked at and analyzed over 50 different products and shortlisted the best 19 of them for further analysis and testing. We visited their website and went through the product descriptions on their store pages and read individual critic reviews to determine the features that a griddle usually has. We then used a group of diverse volunteers to provide feedback on these specific models after trying them out. We compared our volunteers’ final reviews and compared them with the data that we had gathered from the internet. We also tested and analyzed different types of flat top grills to find which ones are better. With all of this information in hand, we then selected the best ten products. Let’s have a look at which ones made it into our top ten! Our research led us to find 49 features that flat top grills can have and the majority of these positive features were gathered from the features list that the products display on their specification sheets and manuals. The rest were features that we found that weren’t mentioned in the manuals but that we considered equally important for both expert and beginner users. We also looked at the pricing of the different products and we chose the ones that we thought offered the greatest value per dollar. Finally, we looked at the frequency of the reviews of each product to determine its popularity as well as exclude any products that have become obsolete so that users can find accurate reviews for the best products in 2018. Why is this our Top Pick? In looking at griddles, we analyzed 49 features of each of the products and this product contains 19 of those positive features. This may not sound like a lot when others in our list have 28 of these features but it is actually the third highest in our list and when you take the price into consideration, this one definitely gives you the maximum number of features per dollar and won’t set you back hundreds. As mentioned, this product isn’t one of the most expensive out there and comes in well below $100. It is not the cheapest on our list but it is still extremely affordable and has every feature that you need to use a flat top griddle well. 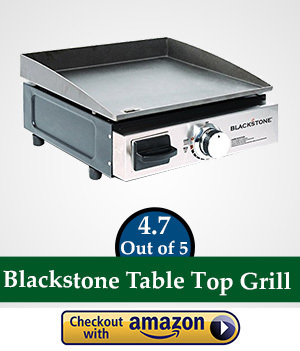 This griddle has the highest Amazon rating of all the products in our list at the time of our research, scoring an impressive 4.7 out of 5. It reviews are really frequent too, so we can be sure that it’s a well-bought product that’s up-to-date with market demands. It received the last ten reviews in just two days, the previous ten reviews in three days and the earliest ten reviews in five days. That’s 30 reviews in just 10 days! It is indeed a popular item! Even though it’s a tabletop griddle, it has its own burner system. 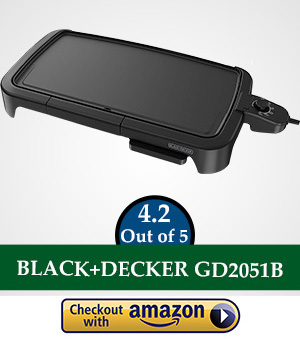 For this low price you are certainly getting everything you need in a griddle. This grill is of a table top design with a spacious, large cooking surface of 260 sq. in. measuring 15.25” x 17” made from heavy duty stainless steel. This model has a useful inbuilt grease catcher and when you are done you simply scrape the grease into the tray and empty at your convenience. It is built to use one pound propane gas bottles as fuel. This grill is portable, which makes it extremely versatile and it can be used for camping trips, hunting, outdoor use, and road trips. It has an easy to ignite piezoelectric ignition. It’s also easy to store by turning the griddle top surface upside down on the top of the body of the grill. It’s also super easy to clean. It can be wiped down with just a paper towel meaning that you’ll be back to enjoying the great outdoors as soon as you’ve done cooking. It has an H-shaped burner made from stainless steel, meaning it heats up really fast, giving an output of 12,000 BTUs. This also means that you can cook multiple things at the same time. At the time of our research, this griddle costs just under $99, which is really pleasing for a griddle with such fantastic features. It has also been reviewed over 670 times, which although this is on the lesser side compared to some, it has such raving reviews and such amazing features that it’s hit our top spot. It also comes with a 90-day warranty. We can’t think of any! This is really the best you can buy! We can’t fault it, hence why it’s in our top spot! If it’s convenience, ease of use and portability you’re after, this is the grill for you! Of all of the products in our top ten griddles in 2018, this one has the highest number of positive features. It is an advanced griddle and therefore has multiple burners to create different cooking areas and has storage tables on the sides too. It is well built and is sturdy, with a storage tray underneath, and strong legs. Without a doubt, it’s the best griddle in our list. However, with all of these excellent features comes a heavier price. It costs around $220 at the time of our research, which is more than double our top pick, hence why it didn’t quite make the top spot. 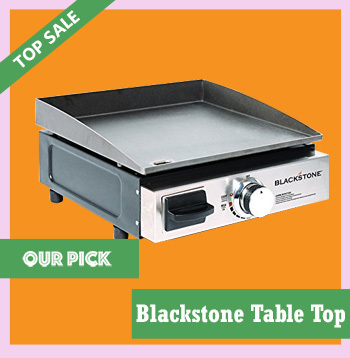 Price is a factor that is important when people consider what griddle to buy and, as a result, it had to be our advanced pick. 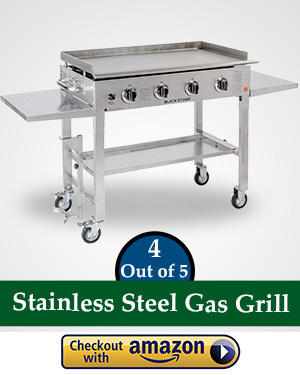 This grill is large and is designed for advanced use, even restaurant or professional use. It measures 62.5 x 22 x 36 inches and weighs 120 pounds. This grill is extremely durable and is built for long-term use with a steel frame that’s powder coated as well as burners made from stainless steel and a thick cooking top made from rolled steel. It has 720 sq. in. of cooking space, which is a fantastic amount of space that will be enough for you if you have the habit of throwing BBQ parties in your backyard every now and then. It also comes on industrial strength wheels, meaning that it’s easy to transport from area to area in your home and garden. This grill has four heat zones that are controlled independently, meaning you can cook various things at once. Additionally, the griddle top is removable. It also features handy side tables so that you can easily prep your food and the 20lb propane fuel tank slips nicely inside, under the shelf on the left-hand side. There’s a handy bottom shelf for extra storage too! As mentioned, this grill has four different zones for heating that are controlled individually with each one giving out 15,000 BTUs, making a total heat output an impressive 60,000 BTUs. The controls allow for many cooking options, increasing the versatility of the griddle immensely. It also has a push button ignition, powered by AA battery, meaning you can click and cook with ease! With the wheels and foldable legs, this grill can be taken to many locations and stored easily too. It’s of restaurant standard despite this too! As mentioned, this is an advanced griddle and isn’t for the faint of heart, although actually it’s really easy to use. It is a very popular choice on Amazon with over 2200 reviews at the time of writing and an average rating of 4.4! We can see its popularity on its rating frequency too, with ten reviews reached in just one of two days. It can’t be beaten in this respect. But, as mentioned, its price is its only flaw. Coming in at around $220 at the time of writing might put it out of reach for many people looking to buy griddles. So, despite having the most features, at 28, we’ve had to put it as our advanced pick rather than our top pick. It also comes with a 90-day warranty. This griddle is a top choice for the professional chef amongst us. However, if you’re a bit of an amateur don’t let that put you off! It’s so easy to use that even the home chefs can use it too. If you can afford the price tag, you won’t be disappointed. Although there are cheaper products on our list that could have been our budget pick, this one comes with the second highest number of features of all of the cheaper alternatives and has the highest number of reviews among them all too. Likewise, it has the best review frequency of all the cheaper options too. Amongst the cheaper products this one is definitely the most popular, functional and also affordable too. This product, although a budget option, offers ample cooking space for a family with a cooking surface area of 18”. It measures 11.5 x 26.2 x 2.5 in. and, when the handles are removed, it can fit easily in kitchen cabinets! It’s made from a top quality non-stick surface (although cooking with a little butter or oil will help make sure that your food cooks well). It weighs just 6.5lbs, meaning that anyone can use it anywhere. The base is made from cast-aluminum which means it’s pretty much guaranteed not to warp. This griddle is our first one that’s powered by electricity. It’s a great budget buy as it still has a removable drip tray that’s taken out by a quick sliding action. It’s therefore very easy to clean and grease isn’t a problem. This griddle is controlled by a ‘control master’ which allows the user to set how hot the griddle needs to be for your cooking. The griddle then takes control to self-regulate the temperature, giving a nice steady and even heat. It has a wattage of 1500w. As this griddle is small in size and weighs so little, it’s extremely portable and can be stowed easily in 18” kitchen cabinets once the handles are removed. The griddle top is also fully submersible which means that it’s super easy to clean too. You simply unlatch the clips to detach the handles and no tools are needed. This is a very popular choice amongst people wanting griddles. It is our budget choice, and it retails for around $30, but it still has a whopping 16 positive features! That’s pretty impressive for a budget option. It has the third highest number of reviews of all of our products, coming just after our Advanced Pick, with over 2100 reviews! It also has an amazing review frequency with every ten reviews being written in a matter of days (between three and seven days). Furthermore, those reviews are all largely positive too with an average rating of 4.6 out of 5. Lastly, it comes with a one year warranty, which is better than any of our other picks above! 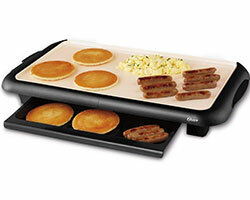 If you’re on a budget then you really cannot go wrong with this tabletop electric griddle. It is packed full of positive features despite its economical price! Why Is It Our Multi-Purpose Pick? The uniqueness about this product is that it’s reversible. It can be flipped over for a ribbed grill side if you want to grill or have grill marks on your food. It also has a flat-top griddle side too. Due to this feature, this product pips the post and becomes our multipurpose pick. It also has a price tag that’s below $50 making it a cheaper option too. There was a cheaper reversible griddle among our griddle reviews, this one has a higher number of positive features, which is why it’s here as our Multi-Purpose Pick. With 1000s of reviews and an excellent review frequency, this product is well up there with the best of them. This grill and griddle is made from cast iron, meaning it’s durable and long lasting. The fact it is made from cast iron means that it will cook food well, without scorching or burning the food. It also retains heat too, so meat can be seared at a higher temperature. It’s also pretty much indestructible. It measures 20 x 10.44 inches with a cooking surface of 19.25 x 8.5 inches which is big enough to be placed on a campfire or to put across two of the burners on a stove top. It’s a crowd-pleaser due to its reversible feature, with the smooth surface for eggs, pancakes or grill cheese sandwiches with the ridged side being perfect for steaks, sausages, and burgers. It is quite heavy, weighing in at 16lb, but that’s thanks to its robust cast-iron body. This griddle features a slight slope allowing for a large grease gutter. The surface is also pre-seasoned meaning that it is non-stick and gets better with use. It’s also a source of nutritional iron too! It’s made by Lodge, who have been around since 1896. It doesn’t have a fuel source given that it’s designed to be placed on the stove top or an open fire. Thanks to the materials, this griddle retains its heat really well and is durable so can really last a lifetime. It doesn’t have heat controls given it goes on top of your stove, but this just adds to its convenience as a multi-purpose option. It has two easy to grip handles which are easy to use to help you store or hang it when it is not in use. This amazing grill/griddle combo comes with a limited lifetime warranty! That’s pretty impressive and is unique amongst all of our picks. 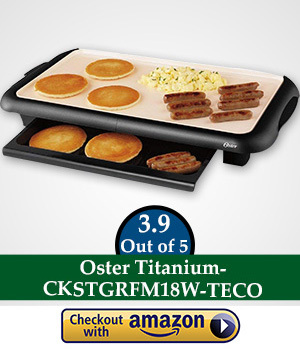 It also has a price tag of less than $40 and is the most reviewed of all of our griddles in this list with over 3100 reviews! It has a rating of 4.3 and has an impressive 13 features despite not having its own fuel source. This is a top rated product with a lifetime warranty and great reviews. If multi-purpose is what you’re after with the versatility of griddling as well as grilling then this one really is a top choice. This grill is another good value pick. It is actually the cheapest one on our whole list, and because of that is has less features compared to some of the others. However it is reversible and also durable with its cast-iron design. 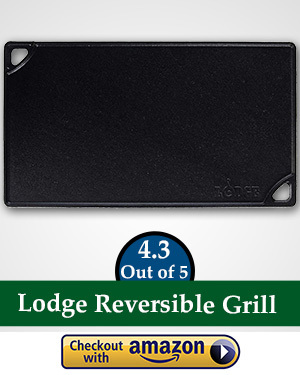 This grill is also made by Lodge like our multipurpose pick. Likewise, it’s also reversible, having both a griddle and grill top. It measures 9.5” x 0.5” x 16.5” and weighs 9lb. It’s ready to use and is pre-seasoned with a finish that’s easy-release. It can be used in the oven, on the stove top or even on an open campfire. Made from cast iron, it’s tough enough to last your whole lifetime with healthy meals every time that you long for. As it’s made from cast iron it has even heat retention and even heating too. As mentioned, it’s reversible which only adds to its versatility. Considering it is very much a budget option, it has 11 positive features. Whilst this is the lowest, we need to bear in mind this is a budget choice. This option is highly convenient in its versatility. It is reversible so can easily be flipped from grill to griddle. It can be used in an oven, on a stove top or even on a campfire. It doesn’t have a power source as a result but this also means that there’s less than can go wrong with this budget option. This one is the cheapest griddle of all of our griddles, which is why it’s so high up our list. It costs less than $25 at the time of writing and has an average rating of 4.3 stars, which is pretty good for a budget griddle. It also has a great review frequency with each ten reviews being received in either 11 or 12 days. There are also over 1700 reviews at the time of writing, making it the fourth most reviewed product in our top ten. If it’s budget but versatility you’re after then this would make a great choice. It is long lasting and durable, despite its cheap price. This grill is for families who are serious about cooking a lot of food. It has a handy warming tray which makes it easy to cook in batches, and it still comes in at a cheap price too. This is an extra-large griddle with 200 sq. in. of cooking surface, meaning you can cook for friends and family. It measures 26 x 12 x 3 inches and weighs just 4.6lb. It’s made from non-stick durable material for the easiest cooking experience and it’s easy to clean afterwards too! It also has cool-touch handles meaning it’s easy to transport around the kitchen. This griddle has an inbuilt warming tray, meaning you can keep food warm ready for serving. It just slides right out! It also has a removable grease tray where the fat and grease can drain away easily so that it’s easy to dispose of. It also has a temperature ready light indicator so that you know when the griddle has reached temperature so you can start cooking. This griddle has a simple thermostat that ‘clicks and locks’. There’s a removable probe which has an adjustable dial for the temperature control. The drip tray and warming tray are both dishwasher safe which means cleaning things after use is a breeze. It has a wattage of 1500 Watts. 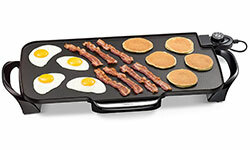 This griddle comes with 17 positive features as well as a two-year limited warranty. 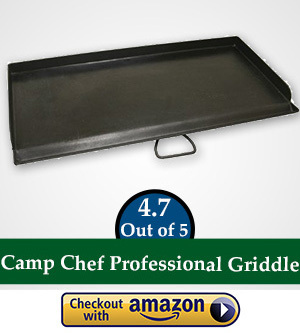 It also retails for around $26 and was the second cheapest griddle in our top ten at the time of our research. It has over 1100 reviews too and a rating of 4.2. In addition, it is reviewed frequently with each ten reviews being received between every 10 and 24 days. This is a very versatile griddle suitable for cooking for a large family thanks to its warming tray! It’s a very good value product, with 17 positive features for a very reasonable price. This grill is great for putting on top of your current stove, and is also compatible with all of the other Camp Chef products. It has a great number of good reviews from happy customers, so a safe choice. This griddle has a large 224 square inch cooking area and its overall dimensions are 15 x 16 inches. It also weighs 18lb. 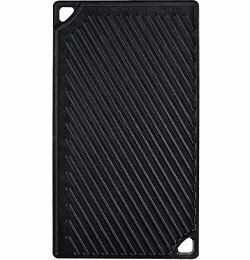 It is made from heavy-duty steel meaning it is durable and will stand the test of time. It also has a built-in carrying handle for added convenience. This griddle has special heat diffusing plates in order to distribute an even heat across the surface, reducing hot spots. It has an inbuilt grease drain for ease of use, to whisk away grease and fat from your food as quickly as possible. This griddle is designed to work over one burner and is compatible with other Camp Chef products and stoves that are 14” and it allows for the quick and even distribution of heat. The steel is already seasoned and is ready to cook on right out of the box! This is not as cheap as some of our other picks but it’s still not too expensive, coming in at around $57 at the time of writing. With that you get 12 positive features and over 560 Amazon reviews. 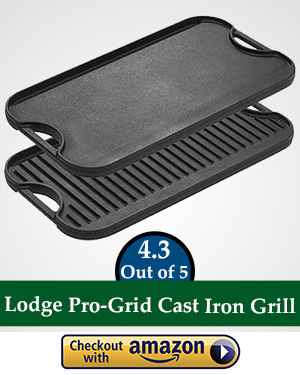 This is one of the lower number of reviews but it does have an averaging rating of 4.7 out of 5, which is the only other griddle in our list that matches the top pick in this respect. Reviews are received between 14 and 27 days so whilst it’s not the quickest turnaround of reviews, you can be sure that the reviews it does receive are very positive. This is a great, versatile option if you’re after a flat top gas griller or griddle to go on the top of your existing stove as it’s compatible with other 14” Camp Chef products. Furthermore, the reviews speak for themselves and with 4.7 out of 5 on Amazon, it ties with our Top Pick. This grill is another good value option, that is at the lower end of the budget. It is an electric grill that is made with a non-stick material. It heats quickly and evenly, making grilling a fab experience. This is an electric griddle which is made from a type of ceramic coating that’s been infused with titanium called DuraCeramic. It’s claimed to last eight times longer than the ordinary coatings that claim to be non-stick. Furthermore, it won’t peel or flake either. The coating is also free from PFOA and PTFE. There’s a 10” x 8” cooking surface and the product itself measures 24” x 13.4” x 4”. This product has a useful warming tray that means you can keep your food warmer for longer, allowing you to cook in bigger batches for bigger social gatherings. There’s also an inbuilt grease channel and this directs grease away from your cooking food and deposits fat and grease into a separable drip tray. We found it perfect to griddle fish and vegetables. This electric griddle claims to cook 30% faster than other similar griddles which will save you energy as well as time. It also has a temperature control that’s fully adjustable and removable for cleaning. This product has 13 positive features and retails at a very reasonable $26.99 at the time of our research. 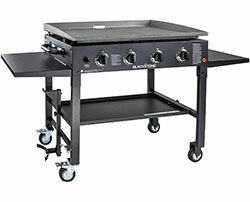 This makes it one of our cheaper choices in our top flat top griller selection. It has a pleasing number of reviews, at over 600 but its rating is slightly lower than other products on our list at 3.9. It usually receives ten reviews every three to four weeks, which is a lot less than our top picks, hence its position in our list. If you’re wanting a cheaper option and an electric griddle then this is a great choice. The coated ceramic is also a decorative as well as a useful and effective addition to the product. This grill is all about having the space to cook in big quantities. The independent burners allow for ample cooking space, and it can be set up in a variety of ways as you like. You do have to pay high for this space though. 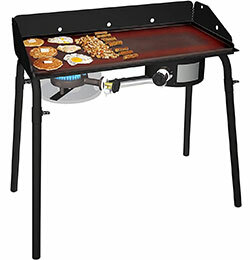 This flat top gas griller and griddle is very versatile thanks to its portability and adjustable legs for easy transportation and balance on uneven terrain. It has three burners in one configuration or two if boiling pots. When set up, its dimensions are 48.5” x 23” x 38.5”. There’s a large grill box and grill on one side and a flat griddle on the other side. These both have a cooking space of 16”x16” which makes a whopping 512” of cooking space altogether. Furthermore, there’s practically no assembly either! It’s also extremely durable made from heavy-duty cold-rolled steel with cast iron plates on the grill. It all has a robust powder finish coating. If you put on the box griller it can reach temperatures of up to 500 degrees Fahrenheit, easily enabling you to get sear marks on your meat. 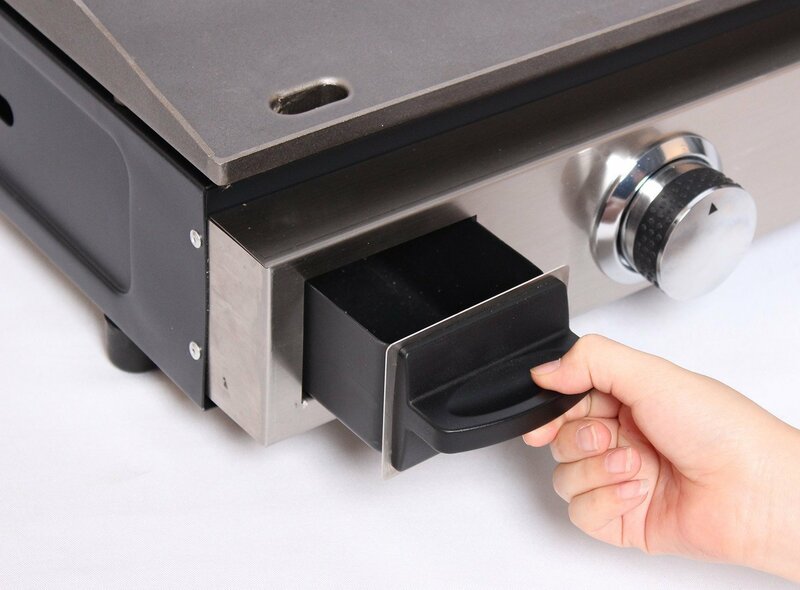 The temperature can easily be lowered to use the griddle. The burners are controlled independently of each other meaning that you can be extremely versatile when you’re cooking on this flat top gas griller and griddle. One is made from stainless steel in an H shape, the other is cast iron and they produce 15,000 BTUs and 20,000 BTUs respectively. 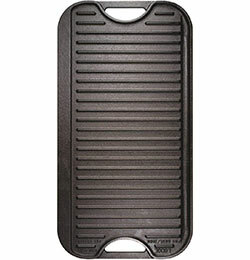 This is the second most expensive griddle on our list with a price tag of just under $177 at the time of our research. It has 13 positive features, which isn’t many features per dollar if you work it, hence why it’s way down our list of top flat top gas grillers. Furthermore, it also has the fewest number of reviews at just over 264 at the time of writing and its rating isn’t great either at 3.8/5. 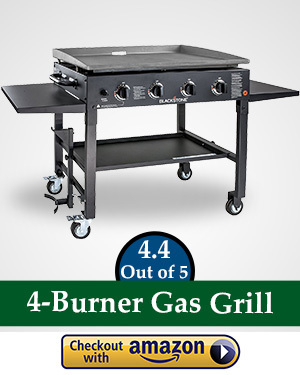 In fact, this is the lowest rated product of all our grills and griddles. The fewest number of reviews of all our reviewed products. If it’s space for a large cooking spree that you’re after then this one is a great choice. It has independent burners that can be individually configured to suit your needs. However, it does come at a price and with not as good a rating as some of the others we have reviewed. This grill is another advanced option which is for the keen grillers. It is the most expensive grill on the list, but it does have four burners and allows for restaurant style cooking. 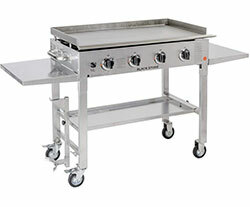 This flat top gas griller and griddle station provides 720 sq. inches of cooking space across four burners. The dimensions of this product are 62.5” x 36” x 22” and it weighs 118lbs. It comprises of a stainless steel frame and has a cooking surface that’s made from cold rolled steel for extra durability. 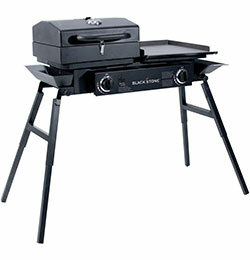 This is a large grill which is ideal for bigger families and large social gatherings. It’s easily transportable as it has ultra-strong caster wheels and the griddle top is also removable. The legs also fold up making it easier to store despite its size. This is a griddle that’s fueled by a 20lb propane gas tank and there’s even a handy place to store the tank under the shelf on the left hand side. There’s also an inbuilt grease catcher so that your food isn’t swimming in grease and fat. 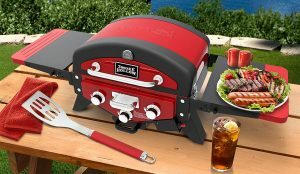 This grill has a battery powered easy to start ignition that works at the touch of the button. It also has two side cantilever shelves to help you prep and store your food as well as holding all your spatula and accessories. Each of the four burners is independently controlled and can give off 15,000 BTUs and made from stainless steel. That’s a total of 60,000 BTUs, giving you all the versatility you need for better grilling. The most important factor to mention is the cost. This unit will set you back over $340 at the time we researched. This is a staggering increased in comparison to all of our other picks and this is why it’s hit the bottom slot. It also hit the bottom in terms of the number of reviews at 280 but this is to be expected with the more expensive products. The last thirty reviews were in a fairly frequent time period of between 15 and 20 days for each ten reviews which was pleasing and is comparable to other griddles in our list. Its rating is a pleasing 4/5 although that is lower than most others in our list. 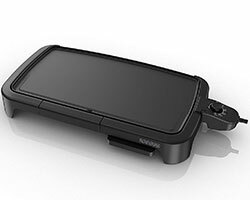 It does have 25 positive features though, which is comparable with our advanced pick however its warranty is only 90 days, which for a large product is pretty poor. If you want to cook restaurant-style or like a pro then this one is for you. It is comparable to our top advanced pick however it comes with an extra $100 on its price tag and we’re not sure it’s worth all that, hence why we’ve placed it in the number 10 slot. Electric Griddle – These griddles are separate to other cooking equipment and usually are a table top design with their own power cord. 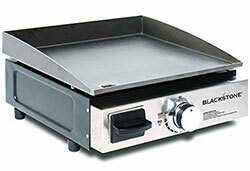 Gas Griddle – Gas griddles have their own burners and are powered by propane gas. Griddle Tops – Griddle tops are plates that are placed on top of a gas stove, either one bought specifically for the griddle top or a standard burner in your home kitchen. When you’re buying a griddle there are some things which you really need to know. Firstly, think about the size of the griddle that you think you’ll need. It really depends on what you want to do with your griddle and how many you want to cater for! Also, do you want to be able to grill as well as griddle? If so a reversible design might be the best choice for you to make. Think also about the versatility of the griddle – does it have temperature controls or varying temperatures? This is especially important if you are cooking different foods at the same time or are catering for a larger group. Not all griddles are suitable for all people. It really does depend on your individual cooking needs. As with any other bit of kitchen kit, you will have to maintain and clean your griddle. If you take good care of your griddle and clean it on a regular basis you can be sure that it will last and stand the test of time. Here are some tips on how to keep yours at its best. Firstly, get all of your things in order. You’ll need water, a spatula with a flat edge, dish soap and paper towels. The dish soap is only to be used if there’s something stubborn stuck to your griddle. Secondly, the griddle needs to be cool but you need to ensure that the grease etc. is not hard or it will take much longer to clean. The flat spatula can be used to scrape off the remaining grease and oil. It needs to have a flat surface so that you don’t scratch the surface of your griddle. All of the crumbs should be scraped off into the tray at the end and then water can be poured over the surface of the griddle. As mentioned, only use dish soap if it’s absolutely necessary. The water will help to loosen up the bits that are stuck to the grill. You can then use the paper towels to scrape off grease. If there are any separate parts, like a grease tray, they also need to be cleaned. If you maintain the griddle it will stand the test of time and it can be cleaned in just two minutes. Try to clean it after you use it so that any grease doesn’t build up. So, there you have it. Ten Griddles each with different characteristics (and perhaps different flaws) all ready for you to make your choice. What will it be? A reversible grill/griddle plate? An electric or a gas griddle? And just how many people do you intend to cook for? These are all very valid questions! If you still haven’t made up your mind have a read through some of our top picks again. We’ve got something to suit all needs and budgets. In terms of which is the best all-rounder, you really can’t go wrong with our top pick. It has everything you could want from a griddle and is versatile and easy to use too. What’ve you got to lose? Get yourself griddling!